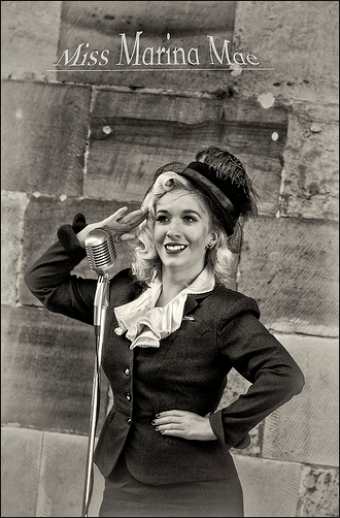 During my lovely day out at Chesterfield 1940s, I was lucky enough to have a chat with the beautiful and talented Miss Marina Mae, a singer on the 1940s circuit who performs at many of the reenactment events I like to attend throughout the year. 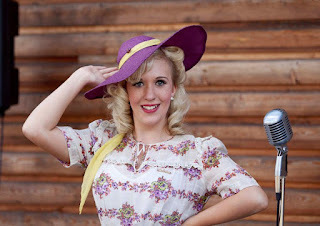 We talked about singing, vintage clothes, and the new Collectif Spring/Summer 2013 collection. Marina was very kind, and even agreed to answer some questions for me. Thanks Marina! 1. How did you first get into singing? - I have been singing ever since I was a little girl in school choirs and in concert parties with my grandfather. I also had private vocal tuition at secondary school and from there I entered various music festivals where I won awards and trophies. I've always loved to sing, dance and act and it's a dream come true to be an entertainer! 2. 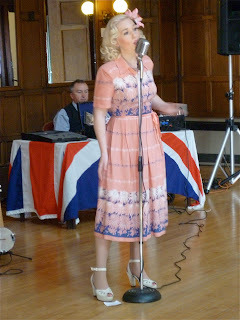 When did you first start singing the 40s music that you perform at events today? - My training is in classical music, but at the age of 17 I wanted to try something different so I decided to combine my loves for singing and the 1940's and so Miss Marina Mae was born! That was 4 years ago and now I am so lucky to be singing around the UK nearly every weekend! It does take a lot of hard work and research, but it does pay off! 3. Which is your favourite song to perform and why? - My favourite song to perform is 'A Nightingale Sang In Berkeley Square'. It was one of the first songs I learnt and now I must have sung it over 200 times but it still feels lovely to perform. I drift off into my own little world now and it now seems so effortless, when really it's quite a challenging song. It's amazing how my version of the song has evolved over the 4 years and that the sentiment behind it still makes me emotional, nearly to the point of tears at some events! I also think the reason I love it so much is that it really is a fan favourite; I'm proud to say that I've brought many people to tears with this song, because it holds so many memories for so many people! I guess you could say it's my trademark song! 5. Do you swing dance at all? - With a strong leading partner I am quite good at swing dance; I know the basics but I need someone to push me in the right direction to achieve more complicated moves! I absolutely love to dance; I used to do tap, ballet and jazz at Joyce Mason's School of Dance for about 8 years. I have recently started learning tap again and I've just moved next door to some brilliant swing dance teachers so I'll be forcing my partner along to lessons soon! 6. I have seen you perform three times now, you always look gorgeous! What are your top tips for buying vintage clothing and creating a vintage look? - Thank you very much Helen! It has taken me a lot of years to build up my vintage collection and I'm very proud of it! My advice would be to invest in a good quality original suit first of all. My favourite vintage dealers are Debbie from the Dress Circle and Betty at The 40's Room. Once you have a suit you can build various looks around it by wearing different hats and shoes, wearing the jacket with re-production swing trousers (Vivien of Holloway are my favourite) or wearing the suit skirt with jumpers or blouses. Research is the key and I have many books on vintage style. I look at vintage clothing as an investment; if you buy high quality and look after it, in 20 years time it will be worth much more! I just love owning little pieces of history! Another good place to look for vintage is ebay, but beware, when you type is "40's dress" you get a whole load of horrid 70's dresses with a '40's look (apparently) so you must know what you're looking for! I always search for "original 40's dress" for a more accurate result. Ebay sellers from the US have really great quality clothing at good prices too, but don't forget customs charges on top! A lot of ladies ask me for fashion advice and I'm always happy to help! 7. You recently did some modelling for Collectif, one of my favourite reproduction/rockabilly brands. Do you have a favourite item from their new collection? 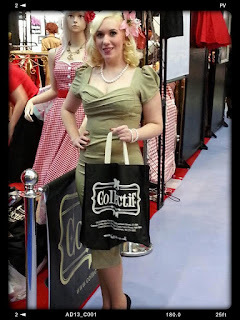 - Collectif have great re-production clothes available in all sizes. My favourite piece of theirs is the Delilah dress in dark green, it's so elegant and flattering. My very favourite re-production brand however is Vivien of Holloway; their new Swagger Jackets are absolutely gorgeous and so are all of the dresses they make. They keep true to the elegant, fitted lines of the 40's and 50's and their fabrics are so authentic and of a beautiful quailty. Everyone looks fab in their dresses, they suit true vintage shapes. 8. 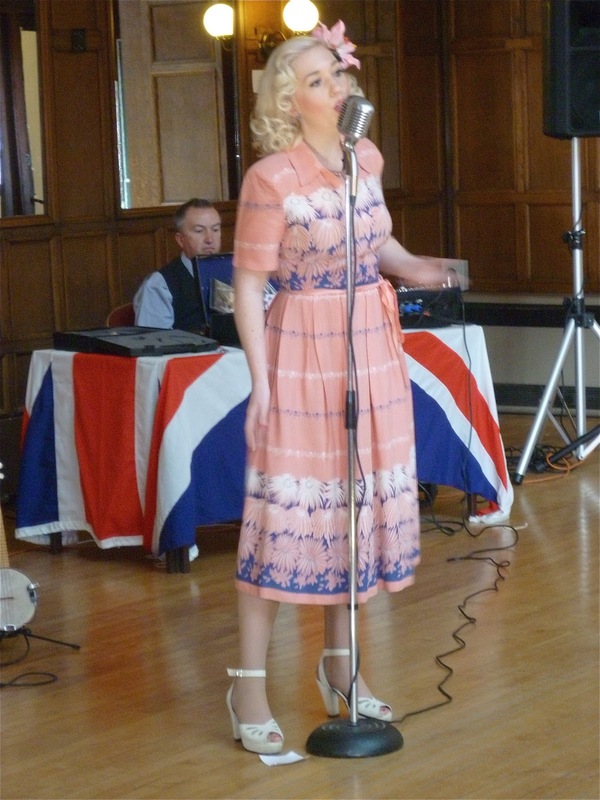 As well as 40s and reenactment events, you also perform at private parties. What is your favourite event (or type of event) to perform at, and why? - I love performing to all kinds of people in all kinds of settings, but I have to say my favourite is the event at Rufford Abbey Park near Nottingham (31st Aug - 1st Sept 2013). It is such a lovely setting, with gorgeous gardens and brilliant acoustics to sing with. Also, a lot of my friends come to this one and make me feel so at home and relaxed! - I shall be recording a new album very soon, I have a new website, www.missmarinamae40s.co.uk, and I've recently moved to London, so I'm looking to start performing down here! Exciting times ahead and I'm so grateful to everyone that has supported me so far! Marina’s next event is Crich Tramway Museum 1940s, Saturday 30th March - Mon 1st April. A full events calendar can be found on her website, under the ‘Gigs’ tab. CDs are also available to purchase in her online shop. You can also keep up with her on Facebook. Outfit: I don't play poker, sir. I play chess.